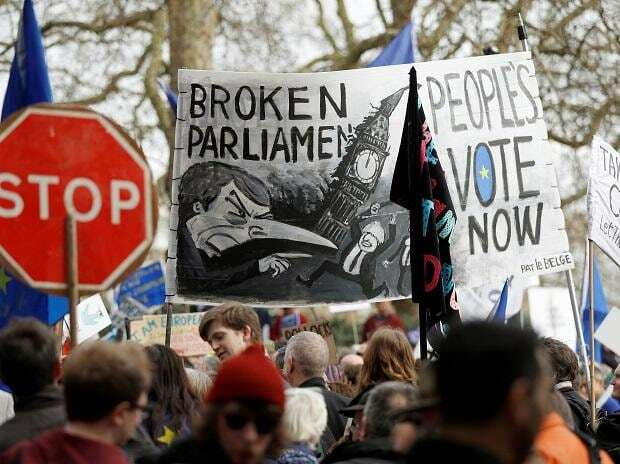 An estimated one million anti-Brexit protesters rallied alongside leading politicians in central London on Saturday to demand a second referendum on the UK’s withdrawal from the European Union. Watson promised to back Theresa May’s twice-defeated political deal — breaking from the party’s position — in return for her agreement to put the withdrawal accord to a public vote. “I will support your deal, I will help you get over the line, to help avoid a disastrous no-deal Brexit, but only if you let the people vote on it,” Watson said. Mariella Frostrup, an organiser, said more than a million people had joined the protest that spread from outside Houses of Parliament and along Whitehall to Trafalgar Square, where large-screen TV screens were set up for overflow crowds. Kahn, calling himself a “proud European”, said May had squandered the good will of EU leaders with a confused approach to the withdrawal agreement. “No matter which political party you support, we can all agree that Brexit has been a complete and utter mess. The British people didn’t vote for the government to gamble on the future,” he said. Watson’s pledge to back May goes further than Labour leader Jeremy Corbyn’s offer. Corbyn has proposed letting May’s deal pass in return for a second referendum, but only by abstaining, a condition which would require her to muster more support from her own divided party. The march follows a tumultuous week for May. The premier had sought a three-month extension from the EU, but got only a two-week delay to April 12. If lawmakers approve her deal on a third attempt, the UK will have until May 22 to negotiate an orderly exit.